Systel Business Equipment is no stranger to awards. If you’ve ever been to our Corporate Office and seen the numerous plaques or had a glimpse at the awards section and noticed the list of accolades on our website, you know Systel has been honored a number of times. From national magazines to manufacturers’ awards, Systel is known in our industry, and we continue to make a name for ourselves. 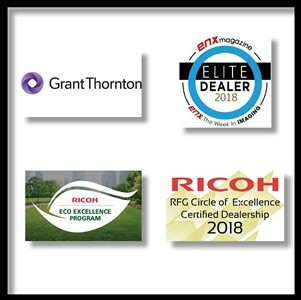 First, Ricoh named Systel an EcoExcellence Dealer for our commitment to sustainability and environmental issues. This was followed in September by Grant Thornton’s announcement of Systel as a North Carolina 100 Business as one of the fastest growing private companies in the state. Moreover, this is Systel’s eighth consecutive year winning the award. In October, ENX Magazine honored our company as an Elite Dealer for 2018, marking us as one of the best and the brightest in the imaging technology dealer community. And finally, later in October, Ricoh again named Systel to its Circle of Excellence for 2019, for our outstanding service and support. Systel is proud to continue its commitment to excellence and will continue to strive towards providing the best customer service and quality products and services money can buy. For more information on Systel or to receive a free assessment of your business needs, contact us at (800) 849-5900.